While it takes male Olympic open water swimmers 1 hour 50 minutes to complete 6.2 miles of swimming in flat-water conditions, it takes a world-class male runner 1 hour 50 minutes to complete 22.5 miles of running in good conditions (at a 2:08 pace). Therefore, at the highest echelon of the endurance running and swimming world, the world's greatest marathon runners can run 22.5 miles while the world's greatest marathon swimmers can only swim 6.2 miles. In other words, the world-class runners can traverse a distance 3.6 times as far as a world-class swimmer. 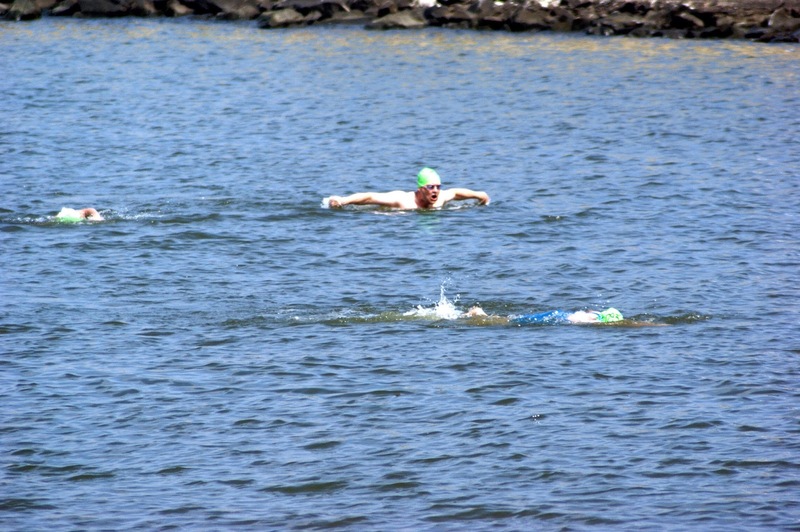 But while runners run in the open terrain, swimmers can do butterfly, backstroke, breaststroke, and freestyle in the open water. And butterfly is the stroke in the open water that most intrigues and fascinates us. Because it remains so extraordinarily difficult to do in the open water. It takes power. It takes guts. It takes strength from the shoulders to the abs. It is dramatic as the body is propelled out and forward in the water. 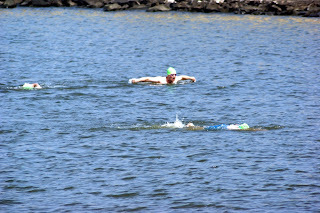 Without a doubt, butterfly is the most unforgiving and difficult of all swimming techniques, both in the pool and in the open water. Brian Suddeth, a butterflying open water aficionado, did some calculations on his fellow butterflyers. Based on his calculations below are some of the speediest distance butterflyers in the world and how fast they are in miles per hour (mph) in various swims around the globe. "Therefore, at the highest echelon of the endurance running and swimming world, the world's greatest marathon runners can run 22.5 miles while the world's greatest open water butterflyers can only swim 3.61 miles. In other words, the world-class runners can traverse a distance 6.23 times as far as world class butterfly open water swimmers," explains Suddeth. "At the bottom line, it seems to me that when doing butterfly in the open water, the target distance for a "marathon class" swim is more like 5 kilometers by speed and effort based on the performances of the very best." The average speed for all these butterflyers is 1.64 mph (2.64 kph). Impressive, very very impressive. Data courtesy of Brian Suddeth.